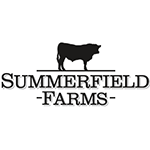 Located on over 500 acres just north of Greensboro, Summerfield Farms is a locally owned and family operated working farm. The farm team brings decades worth of passion and experience together to produce high quality, great tasting, nutrient-dense food for you. We have a robust on-farm market that is open year-round and stocked with 100% grass-fed beef, eggs from free-range chickens, and seasonal produce. We also invite you to consider the farm’s serene setting as the destination for your next special event, be that a wedding, corporate event, birthday party, or charitable outing. We consider ourselves to be "Certified Transparent" and welcome you to contact us for a tour to see our practices for yourself.